If you'd like to give your personalized guest book a special touch, you may want to consider custom guest book pages. We can create a custom guest book page layout to finish your custom guest book just the way that you want it. Your page title, columns, headers, line configuration, and art can all be personalized on the page to achieve the look that you have in mind for your book. Photo pages may also be integrated within your guest book to record the faces and memories associated with the names on your guest pages at your special events. Please feel free to give us a call anytime to discuss how we may craft the perfect guest book for whatever your purpose may be. Are you seeking a leather guest register for a specific purpose? No matter if it's a hotel guest register, vacation home guest book, ranch guest book, wedding guest book, or office guest book we can design a leather guest book cover and custom guest book page design to accommodate your needs. Photo guest books are also available upon request. Please feel free to contact us to discuss how we might craft a Powell Leather guest book for you! Please feel free to browse our website to view other great Powell products. 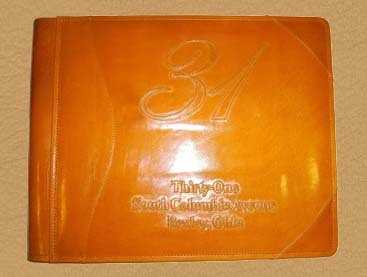 Leather photo albums, photo portfolios, photo envelopes, letter pad portfolios, and wine totes are also available. Whether you yourself, or a family member has just completed a tour of military service, we can create a custom leather photo album or military scrapbook for you to memorialize the time, events, and accomplishments which you have gained from your experience. 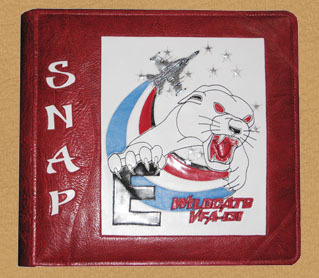 We can create a military photo album personalized any way that you like. Army photo albums, Marine Corps photo albums, Air Force photo albums, Navy Photo albums, and U.S. Coast Guard photo albums are all available from Powell Leather. 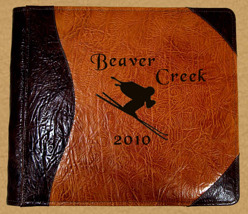 Please feel free to contact us to to discuss how we may custom design an leather album for you. Please feel free to browse our custom leather guest books, leather photo envelopes, leather photography portfolios , and letter pad portfolios. 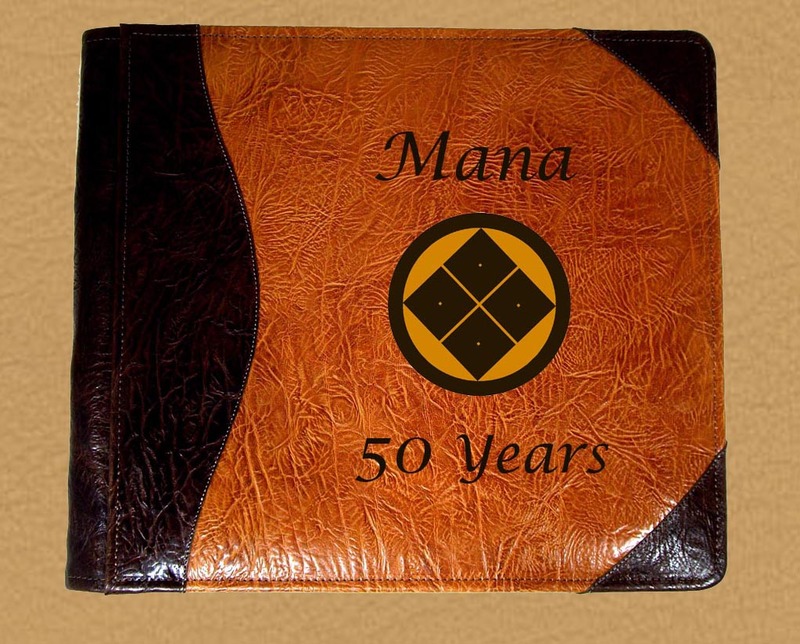 Are you looking for a handsome leather guest book for your reception area? Businesses all over the world come to Powell Leather when they're seeking something unique to welcome their guests. 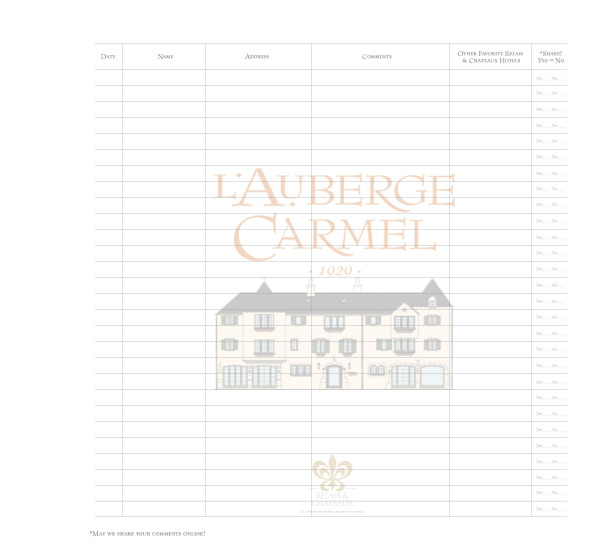 Would you like an absolutely custom guest book page layout? We will design a page layout to retrieve the information that you want to collect from your guests, and put your logo or an image in the background to convey the feel that you want from your book. Our leather guest registers are crafted from the finest materials available by seasoned craftsmen to offer years and years of faithful service to your company. All of our leather guest books are refillable. Just give us a call when you're in need of more pages, and we'll ship them to you within one business day. Please feel free to give us a call anytime to discuss what it is that you are seeking, and we'll be happy to spend as much time with you as is necessary to design a book which will accommodate your purpose beautifully. We design each book and page set on a per customer basis. Please take a moment to browse our website. We have an excellent selection of leather photography portfolios, leather photo albums, professional presentation portfolios, letter pad portfolios, photo envelopes, leather wine totes, and more.